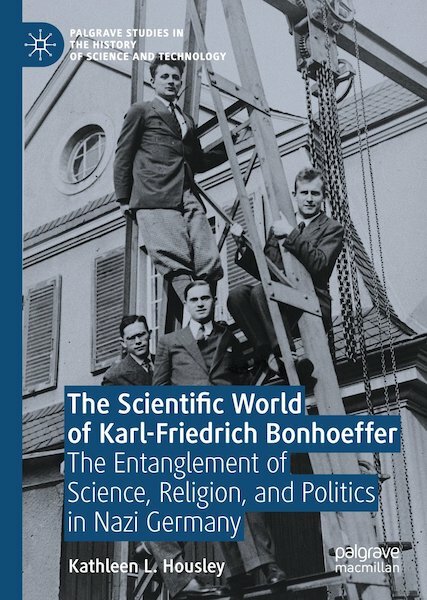 This is a fascinating and important study of Dietrich Bonhoeffer’s older brother Karl-Friedrich, the circles of leading German scientists within which he moved, and the challenges that led to varying degrees of personal and scientific “entanglement” with the Nazi regime. (In full disclosure: I provided an endorsement for this book and am credited in the acknowledgments). Born in 1899, Karl-Friedrich Bonhoeffer was the oldest of the Bonhoeffer siblings. He was a brilliant chemical physicist who co-discovered (with Paul Harteck) that para-hydrogen could be converted to ortho-hydrogen, a discovery that led to ground-breaking research on the “heavy water” necessary for nuclear fission. Although he never received the honor, Bonhoeffer would be nominated five times for the Nobel Prize in Physics. By 1933 he had an international reputation; in 1934 Bonhoeffer became chair of physical chemistry at the University of Leipzig, joining Werner Heisenberg who held the chair of physics there. Karl-Friedrich and his colleagues had been trained to dedicate their careers to the vocation of “pure science”—the realm of objective research, experimentation and theory, which they believed could and should be pursued independently of the political and cultural events around them. As Housley observes in her introduction, after 1933 this left German scientists “dangerously vulnerable to manipulation” (5) and it put figures like Heisenberg and Bonhoeffer under growing pressure as the Nazi leadership began plans to build an atomic bomb. Housley offers a haunting portrayal of how Germany’s elite scientists navigated these pressures and the ethical challenges they confronted under Nazism, as well as how they addressed their records after 1945. Sometimes those ethical challenges were deeply personal. One of the most wrenching (and revealing) accounts in this book is the story of Karl-Friedrich’s relationship to his mentor Fritz Haber, a 1918 Nobel Prize winner who was director of the Kaiser Wilhelm Institute for Physical and Electrochemistry. Haber was Jewish, as were almost forty percent of his staff. Under pressure he stepped down in April 1933 but post-dated his resignation by six months, hoping to buy time to help the other Jewish staff members find international positions. Haber also suggested that Karl-Friedrich be named co-director of the Institute but was overruled by the Nazi-appointed acting director Gerhart Jander. In 1934 Haber died in exile. The following year Karl-Friedrich Bonhoeffer and Max Planck organized a memorial service for him in Berlin. In response Reich Minister for Science, Education and Culture Bernhard Rust prohibited civil servants from attending. Planck insisted on proceeding with the service but Bonhoeffer, agonizing about the possible repercussions for his career and his family, went but could not bring himself to enter the building. His prepared remarks were read inside by the German chemist Otto Hahn. The use of “pure science” for Nazi political and military aims posed equally treacherous challenges. Karl-Friedrich was never part of the “Uranium Club,” the group of scientists who began to work on the Nazi nuclear project, but many of his peers, including Heisenberg and Harteck, were involved. As a result he was consulted several times during the war and certainly knew what was going on. At the same time, his brothers and brother-in-law Hans von Dohnanyi kept him abreast of resistance plans. After 1945 Karl-Friedrich courageously tried to set the historical record about the German scientists straight. He also reached out to Jewish colleagues who had been forced into exile such as Michael Polanyi and Frances Simon, encouraging them to return to Germany. Simon’s initial response was: “In my opinion, the German scientists lost their honor in 1933 and have done nothing to regain it” (259) After much hesitation both men eventually returned to visit Karl-Friedrich, who had become director of the Max Planck Institute for Physical Chemistry in Göttingen. Karl-Friedrich died of a heart attack in 1957, at the age of 58. This is an honest book that portrays Karl-Friedrich Bonhoeffer in moments of compromise and courage. Without slipping into apologia, Housley offers a nuanced analysis of the complexities of that era and, just as importantly, gives us an unusual glimpse into the Bonhoeffer family. She also does a superb job of explaining the scientific significance of Bonhoeffer’s work in a readable and understandable way for non-scientists. The focus on Karl-Friedrich Bonhoeffer and his role in the family casts a different light on Dietrich Bonhoeffer and on the relationship between the two brothers—one of them an agnostic scientist, the other a theologian. Yet the two were close, particularly during Dietrich Bonhoeffer’s imprisonment, and after reading Housley’s book I re-read the correspondence between them with deeper appreciation of the importance of this relationship for Dietrich, and new insights into the Bonhoeffer family and the circles in which they moved. This book ventures into very different territory than most literature on Dietrich Bonhoeffer, but that is all the more reason why Bonhoeffer scholars should read it. [*]The views expressed are those of the author and do not necessarily represent those of the United States Holocaust Memorial Museum.